As you all know by now, I spend a lot of my free time pottering about in the kitchen and mixing ingredients just to see what come out, because why not? To me cooking is nothing if not fun. So here I am with aubergine roll ups! I have seen variations of this recipe online but as always I have added my own twists and after different combinations decided this is the one that works for me. Having said that please don’t feel limited to use the same filling, after the ricotta, egg, Parmesan and herbs the rest is up to you. Have some Sundried tomato? Chuck them in. Mince meat? Why not! Anyway my point is, with this recipe, as with all cooking, the world is your oyster. Take a sheet of kitchen paper and pat your aubergines dry, a lot of juice should come out at this moment, then brush both sides with olive oil drizzle some pepper and bake for 20 minutes. Meanwhile mix your ricotta, parmesan, fresh basil, dried oregano, egg, salt and pepper, chilli flakes and cooled down spinach and mushrooms. Mix well and set aside. Pour a couple of tablespoons of sauce into your oven dishes and set them aside. 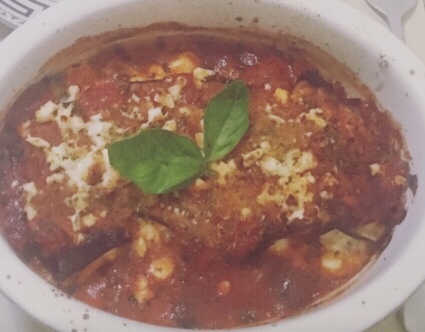 Once your aubergine are out of the oven take one, spread a tablespoon of your filling on it and roll it on itself, then place it in your dish on top of the sauce. Repeat with the rest of the aubergine. Pour the rest of your sauce on top, drizzle with some herbed breadcrumbs, Parmesan and crumbled feta cheese. Bake at 200 for 25 minutes.